A mouth-watering Old Firm Derby is just around the corner as Rangers host Celtic at Ibrox this Saturday. 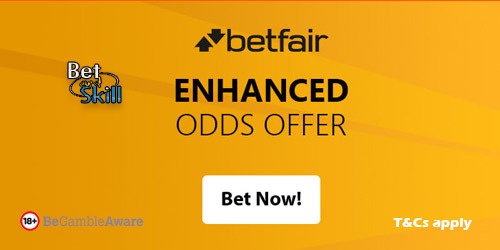 Betfair are offering crazy odds on this epic clash - 50/1 Rangers to win or 25/1 Celtic to beat Rangers + £100 bonus! Celtic won five of their six competitive matches against Rangers last season, drawing the other. The last Old Firm Derby at Ibrox was one to forget for Rangers who lost 1-5 at the end of April. They have not beaten Celtic in a league fixture since the 3-2 success at Ibrox in March 2012. Are you placing a bet on the Old Firm Derby? Claim 50/1 Rangers to beat the Bhoys or 25/1 Celtic to beat the Gers! Plus, get £100 bonus as new customer! 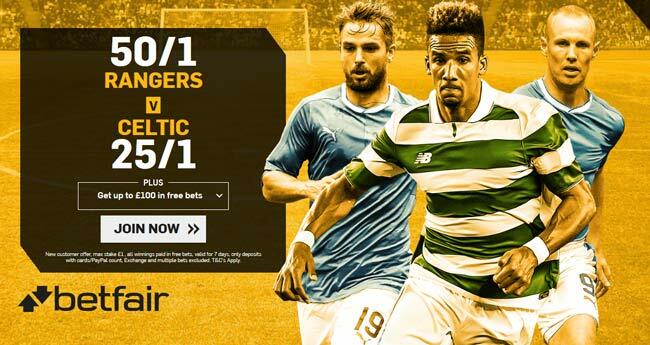 Place your first bet (max £/€1) on Rangers or Celtic to win Saturday's fixture! • Place a bet on Rangers or Celtic in the 'Match Odds (90 mins only)' market at the enhanced price. • Winning Example: Enhanced 50/1 x max £1= £25 paid in FREE BETS plus £1 qualifying stake returned as CASH. "Get 50/1 Rangers or 25/1 Celtic to win the Old Firm Derby at Betfair + £100 bonus"